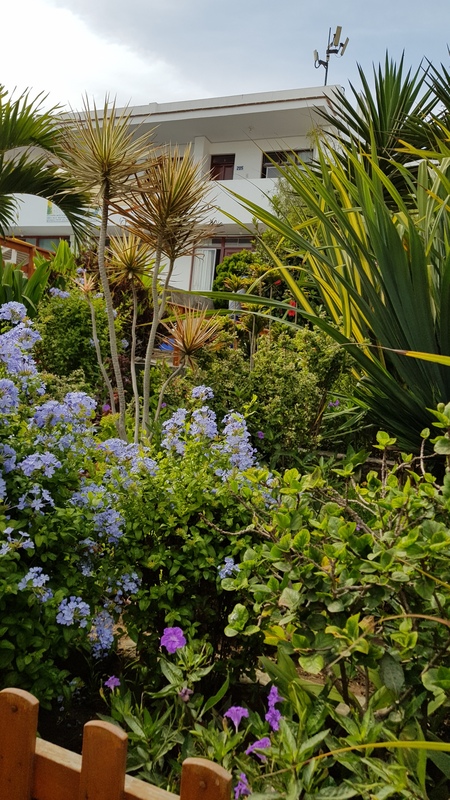 We decided to visit northern Peru, and headed for Playa Los Organos, on the coast between Piura and Tumbes, stopping for two nights on the way. The first day was familiar territory where we passed familiar archaeological sites. Just north of our home in Barranca is the Fortaleza de Paramonga, southernmost outpost of the Chimu empire. The Chimu are not as well known as the Inca, because in the great battle between opposing empires in 1470, the Chimu lost, and as we all know, the victors write history. Just outside the Casma Valley is Chankillo, a fortress and ancient observatory built around the 4th c. BC where 13 small towers align with the annual movement of the rising and setting sun. Cerro Sechin is nearby, its main structure lined with carvings of warriors and victims. More sites line each valley until you arrive in the Moche Valley home to two of the great ancient societies of ancient Peru, the Moche and the Chimu. 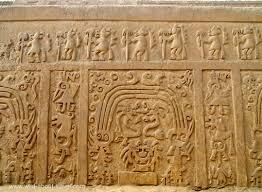 The Huaca de la Luna is the iconic capital of the Moche, who controlled this region from about 100-700 AD. They built vast adobe brick pyramids with brightly colored figures painted on each tier. 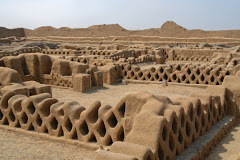 Its twin, the Huaca del Sol, was mined for the gold in tombs by the first Spanish explorers, by diverting the Moche river to wash away the adobe. Fortunately for us, they left a portion for us. 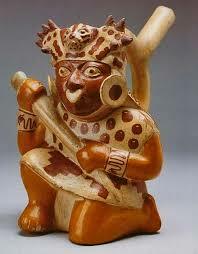 The site museum, completed just a few years ago, displays the trappings of Moche power. Burials found within the pyramid were dressed in wide beaded collars, gold crowns and masks, surrounded by pottery molded into plants, animals, and people, or painted with detailed scenes of ceremony and battle. It is fantastic. 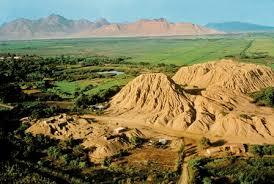 Before leaving town you have to visit the other great empire of the Chimu at one of the royal enclosures of Chan Chan. 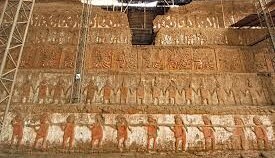 Each ruler built a new palace, a huge enclosure of adobe with walls more than 15 feet high, sculpted with figures of fish, pelicans and other creatures. Within each royal enclosure was everything the ruler needed, meeting rooms, living space, even a reservoir dug into the water table to provide water. Chimu elite were buried with masks of gold and elaborate pottery. The scale of these buildings is what’s most impressive, and the range of shapes sculpted into the adobe. The Chimu empire developed around 900 AD and died out after the defeat by the Inca in 1470. When we stop in this area we always stay at the Hotel Bracamonte in Huanchaco. It is on the beach outside Trujillo and a relaxing stop after a day of visiting archaeological sites. It has a lovely garden by the dining area that you can enjoy while having breakfast. The fruit, yogurt and granola combo is always my choice. Our only mistake this trip was failing to enjoy one of the excellent restaurants in Huanchao for seafood at lunch time. When we went out in the evening for dinner, most places were closed and we ended up eating cake and ice cream for dinner. We won’t let that happen again. The next morning we headed into new territory. We’ve driven as far north as Chiclayo to see the Museo Tumbes Reales de Sipan, where the golden burial of the “Senor de Sipan” is displayed. This is one of the most elaborate tombs we’ve ever seen. The tomb was found by grave-robbers, taken over by archaeologists who had to camp at the mouth of the tomb and patrol 24/7 until the Peruvian government acted to protect the treasure. The hero of the story is Peruvian archaeologist Walter Alva, who spearheaded the site protection and stuck with the site until the museum was built about ten years later. 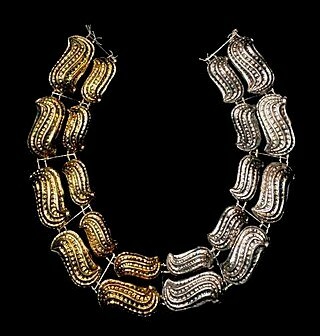 There are fantastic objects in the museum including beads on a burial necklace shaped like peanuts made of gold and silver. The site where the tomb was discovered, Huaca Rajada, is also worth a visit. Late Moche tombs like Sipan though not quite as large are still being uncovered periodically. A site museum is usually built for each one, like the Senora de Cao. Once you’ve seen the Sipan museum, though, you’re spoiled by the amazing wealth on display and none of the others is quite as rich. Beyond Chiclayo was new territory for us. There are many other sites along the way, though for us it was a case of so many sites/so little time. We passed Pampa Grande, where Jonathan excavated for part of his dissertation research, Bataan Grande, Tucume, and many others as we drove toward Piura. It took all day to get there with only a stop for gas. The landscape turned dry, and we saw more of the damage done by the 2016/2017 El Nino. Sections of road are washed out and rebuilding is underway but not completed. River basins are scoured out and though you cannot tell from the road, thousands of people still need new housing. In Piura we stopped at an oasis, the Casa Andina Premium Hotel. Our room had air conditioning, the pool was a great contrast to the heat that was building all day long. We went out for dinner to Tayanti, a restaurant near the hotel with many positive reviews. We had delicious cocktails but found that the menu included only two “fish.” Fish of the day was conger eel, a soft white fish that is the cheapest in the market. Neither of us like it much. The other choice was salmon imported from Chile. We finished our drinks and went to the opposite side of the courtyard to Tao, where we ordered sushi that proved to be delicious with neither conger or salmon involved. We returned to our air conditioned oasis for the night.